Global branding - the value of having your logo on a VTH3 t-shirt! Vung Tau Hash proudly boasts 250+ mostly itinerant members from many different countries who travel all over the world for work and play. To say they add value to our sponsors by wearing their VTH3 t-shirts on their travels is a major understatement! Do you have any photos of yourself or someone else wearing a VTH3 t-shirt in an unusual location? If so, send them in to mismgmt.vungtauhash@gmail.com and join our global "rogues gallery" - see below! VTH3 sponsors showcased at 5,416 metres above sea level! 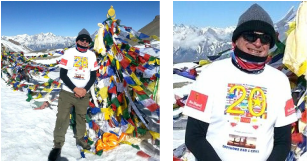 Thanks to VTH3 Hasher Hot Dog for this photo of his mate and occasional VTH3 runner Clive Parsons wearing his VTH3 "20 years anniversary" t-shirt, complete with highly visible San Miguel and Offshore Bar 1 logos, whilst trekking through Thorung La Pass, Nepal - 5,416 metres above sea level! ...and again in Ulsan, South Korea! Many thanks to VTH3's Calamity Jane for this montage of former VTH3 stalwart and now Ulsan Hash Scribe Cap St Jacques proudly wearing his VTH3 "20 years anniversary" t-shirt displaying San Miguel and Offshore Bar 1 logos. 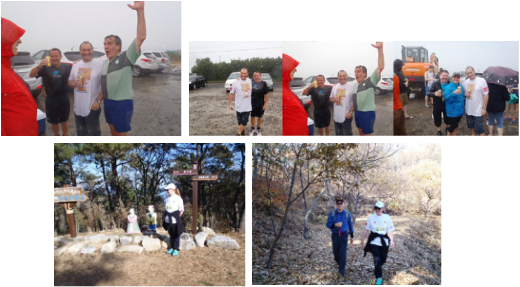 And thanks to CSJ for these photos of Pippi Longstocking on a recent outing with Ulsan Hash! Pippi is wearing her VTH3 "600th run" t-shirt showcasing sponsors San Miguel, GL Noble Denton, NI-limits interactive digital media agency, and SEC Star Engineering. Our hardy ex-VTH3 stalwart Cap St Jacques somehow managed to convince a group of friends to join him on a hike up Mt Jirisan - no less than 1,915 metres above sea level! And they did it all without oxygen masks or sunscreen! Probably not too many tourists up there, but anyone in the vicinity couldn't have missed CSJ's t-shirt promoting VTH3 major sponsor​ San Miguel! How about the London Olympics! Live Wire and Private Business in London, just one week before the Olympic Games. LW's t-shirt was for VTH3 #391: a children's charity run. 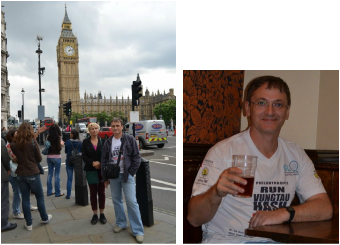 The many sponsors to benefit from LW & PB's sightseeing in London (including the pubs!) were Germanischer Lloyd, San Miguel, La Vie, M-I SWACO, ROMONA, Amigos (Dong Xuyen IP) and Aker Yards. Mile High sends their best regards and says she and husband Don "2 cans" Bingham miss everyone in Vung Tau! 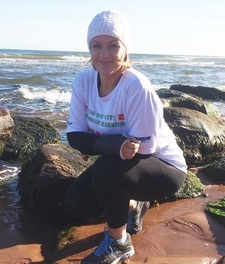 ​New Hasher Brittany Ross returned to Canada recently for surgery on her injured wrist - and sported her VTH3 "700 runs" t-shirt while visiting hospital, which no doubt caused some comments! It certainly gave our sponsors some unexpected exposure - with San Miguel, Shirts North, Ho May Park and WTF Cafe now familiar names in at least one Canadian hospital! Brittany reports that her wrist was plated and will be in a cast for a few more weeks before starting physio. Her spirits are good and she's been doing workouts in the gym. Dyrenuten Hardangervidda 1245m above sea level..
​Former VTH3 stalwart and major trail-setter Jimmy "Cap St Jacques" Hyde, now living in Norway and "flying the VTH3 flag" around the fjords and mountaintops! ​According to Wikipedia, Kjerag or Kiragg is a mountain in Forsand municipality in Rogaland county, Norway. The 1,110-metre mountain sits on the southern shore of the Lysefjorden, just southwest of the village of Lysebotn. Its northern side is a massive cliff, plunging 984 metres (3,228 ft) almost straight down into the Lysefjorden, a sight which attracts many visitors each year. Another tourist attraction, the Kjeragbolten, a 5-cubic-metre stone wedged between two rocks is located on the mountain. The Kjeragfossen waterfall plunges off the mountain down to the fjord. It is one of the tallest waterfalls in the world. Kjerag is a popular hiking and climbing destination, with many difficult routes going up its steep faces.